Here in Ocean City, MD there’s quite a bit of living history. You can enjoy many of the same things today, that people enjoyed 50 and even 100 years ago. Trimper’s Carousel, Fisher’s Popcorn and swimming in the Atlantic Ocean are just a few that come to mind. One that might not come to mind on first thought, but is very much a part of Ocean City’s history, is the town’s skatepark. THE OCEAN BOWL. The Ocean Bowl’s roots run deep down on 3rd street, so deep, that it is, in fact, the oldest Municipal Skatepark in the world! Back in the 70’s, skateboarding was becoming increasingly popular. Being a surf town and considering the close relationship that surfing and skating share, skateboarding caught on quick here. Naturally, surfers would look to skateboarding when the winds blew the surf out. With the rise in popularity, and to the dismay of many of the public, city officials banned skateboarding in Ocean City. Many skateboarding supporters, led by legendary concerned mom Haystack Marlowe, attended the next council meeting pleading their case for a legal place to skate. Thus the idea of the Ocean Bowl was born and, with many thanks to the originators, in 1976 the park opened. 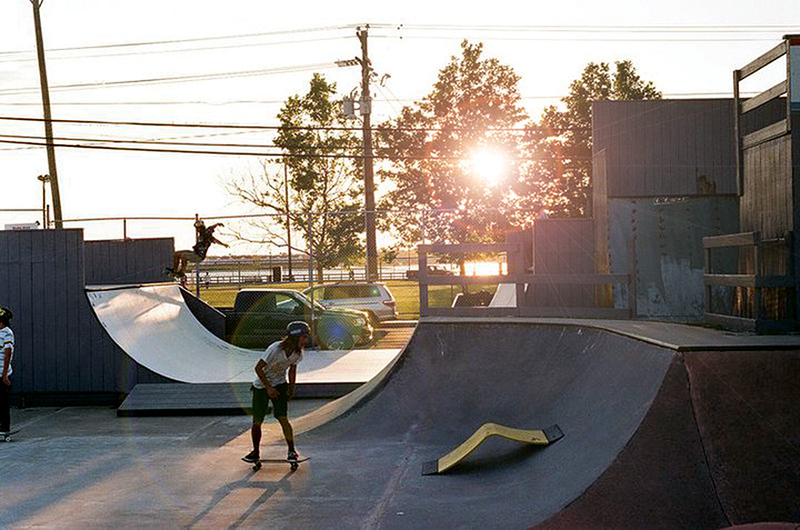 Today, the park consists of artisan poured concrete that challenges skaters of every level. Walls start out around 3’ and grow from there, there are rounded corners, hips, steel coping, banks, escalators, bare concrete lips, and a burly gnar wall that keeps the most skilled skater scratching their heads. Then there’s the vert ramp, mini ramp and considered a favorite among many, the Ocean Bowl pool. It’s fast, smooth concrete with checkered tile and barking pool block is a destination spot for many while keeping the locals coming back for more. If you don’t skate but would like to watch there is a ‘crow’s nest’ observation deck, where onlookers can watch, free of charge. The Ocean Bowl has been ever-changing since first being built nearly 40 years ago, but what it stands for and will always be is a safe place for people to participate in the sport they love. Sadly however, the park and the whole idea is being threatened with a partial closure, again leaving skateboarders without a legal place to go. There will be a hearing on partially closing the Ocean Bowl at City Hall in downtown Ocean City on Monday the 20th at 6pm. For more info and to support the Ocean Bowl click HERE.